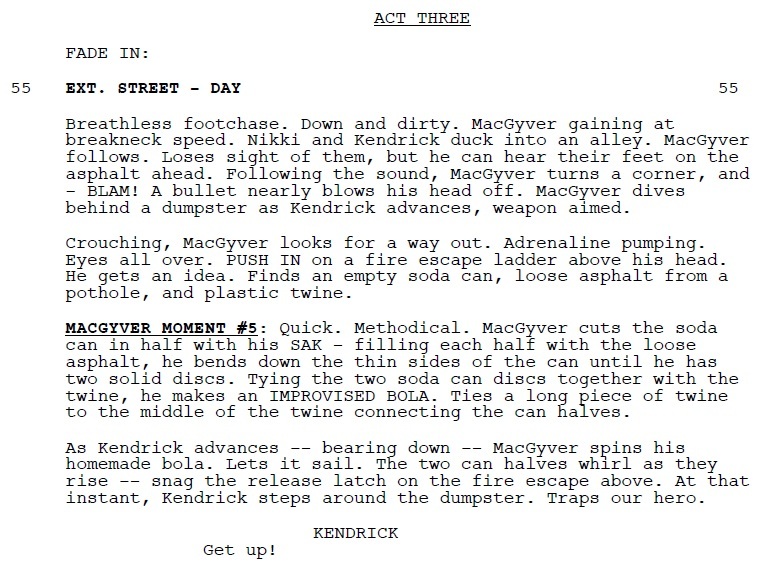 The rebooted Pilot Script for the MacGyver Reboot was written by Executive Producer Peter Lenkov. An earlier version of the script – the Revised Network Draft (June 20, 2016) – has been floating around for a while now. I have been looking at Deleted Scenes in that Draft in several of my blog posts. Of course, a script isn’t written and “sold” within the first try. There are revisions; lots and lots of revision. There must have been several earlier versions of the script used for filming. On September 18, 2016 – only days before the Series Premiere – SpoilerNet posted a summary of the Pilot Episode Script online. 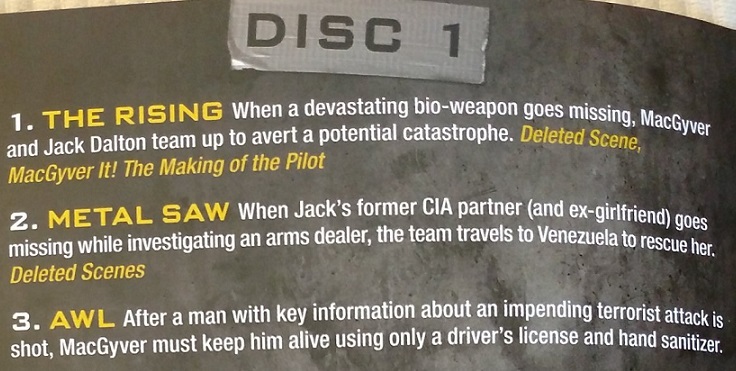 After watching the episode and reading the beforementioned Revised Network Draft, it’s clear that the person posting these spoilers must have had access to an early version of the script that never made it into production. I’m looking at some of the interesting story or character parts in there. One big difference in this early script version: Patricia Thornton was never part of the Lake Como mission. 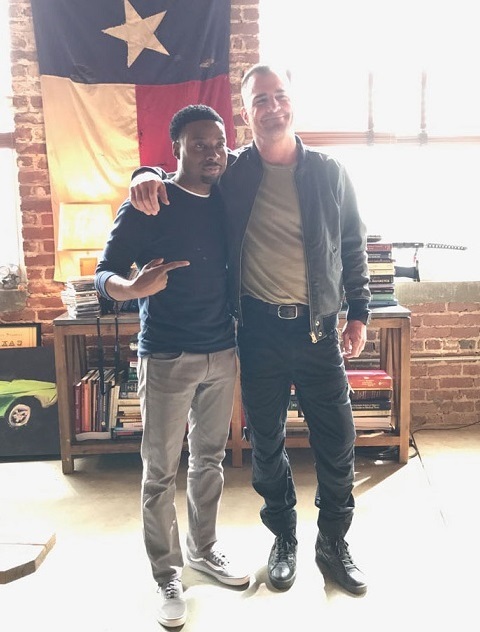 It’s Nikki that gives MacGyver all the information he needs to know. In my opinion, this makes a lot of sense. There’s no need for Thornton to be there. They obviously had enough information concerning the whereabouts and enough time to bring a team and surveillance. In the Pilot Episode, all Thornton does is descending the stairs looking all dolled up and telling MacGyver where the safe is located. Of course, she could have been part of a bigger scheme (e.g. infiltrating the scene days or even weeks before in an undercover mission to gather information), but logic suggests this would have been done by another agent, not by the boss. 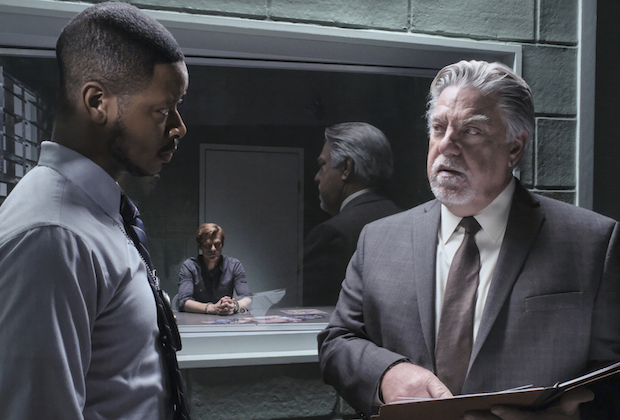 Storytelling-wise, it makes sense to include Thornton, though: All the important “players” – aka the series regulars or the main cast – of the new show are introduced within seconds, tied together via MacGyver’s voice-overs. They would have needed another introduction scene for Thornton (see below how it was done in this script version). As we all now, the Lake Como Mission goes south and Kendrick (in this early script version still an unnamed villain) holds Nikki at gunpoint. What’s happening now might make you scratch your head (or make you searching for your pitchfork): MacGyver pulls his gun. Uhm. Yeah. That happened. They crazy, no? I think all Original MacGyver fans will agree here that this makes no sense at all. And if this had stayed in the script, the outrage would have been one of epic proportions. I don’t know what Peter Lenkov has been thinking while writing this. Maybe he had an idea of a new backstory about MacGyver’s dislike for guns for another episode. Maybe he was high on caffeeine and in dire need of sleep. I don’t think I need to write any further comments on this. In the Unaired Pilot, MacGyver had a best friend from High School called “Gunner”, played by Joshua Boone. I don’t know if they were supposed to be room-mates as well, but it’s clear that Lenkov took that idea, transforming Gunner to Bozer very early on. The introduction of Patricia Thornton is a nod to the Original MacGyver Pilot. In the Original Pilot Episode, MacGyver lives in the Griffith Observatory and spends time with his “little brother” when his boss arrives in a helicopter that lands directly in front of the observatory. It doesn’t really make sense that Thornton takes a chopper just to show him a video. A chauffeur bringing her in a limousine would have been a fancy enough choice. I like that they tried to bring in another Easter Egg that only people knowing the Original Pilot would recognize, but I think the way it ended up being filmed worked much better overall. Reading the beginning of the next scene, it feels like Lenkov intended to have a big room full of techs bustling around. Of course, such a scene would need lots of Extras and staging and time, so it turned out smaller in the finished episode. I think it’s a bit unfair that they tried to blame all onto Mac and Jack. The intel was either not sufficient (e.g. what kind of weapon was being sold) or all wrong (e.g. about the hand-scanner or the security detail) – so it was partially Thornton’s and Nikki’s fault as well. Of course, we can’t just blame the “dead” girl. The rebooted Pilot Script for the MacGyver Reboot was written by Executive Producer Peter Lenkov. An earlier version of the script – the Revised Network Draft – has been floating around since October 2016. There was a Production Draft from June 29 and several revisions (Blue, Pink, Yellow and Green) when they did the first table read on July 8. I’m taking a look at the Revised Network Draft of the Pilot Script from June 20 (2016). 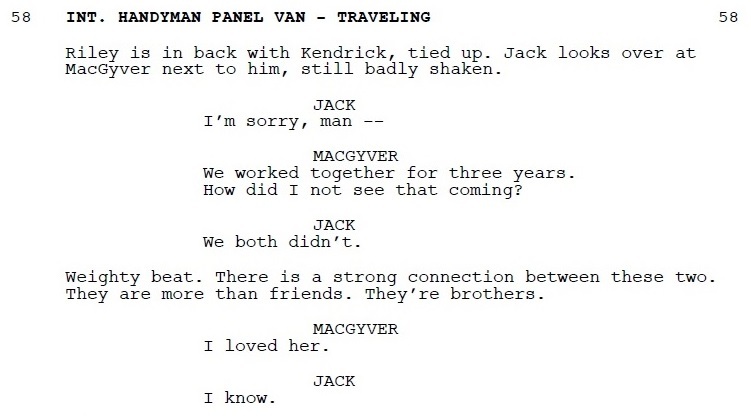 This is the second time in the script that MacGyver states he loves Nikki. In the finished pilot, the L-Word is never mentioned at all. NIKKI: When did you learn to speak Italian? MACGYVER: When you said yes to Rome. Somehow, Jack strikes me as the romantic type, despite not having much luck in the love departement. I don’t think he would believe in the concept about all women being liars. Also, it’s not clear if Rome was just a destination for a romantic holiday or if “more” had been meant to happen. Considering that MacGyver and Nikki had been dating for two years and apparently have known each other for three years, it’s possible that maybe he would have asked her to marry him? Seems like a convenient little plot bunny that in case Tracy Spiridakos’ Nikki came back for another episode, there would be some kind of big previously-planned-marriage-proposal-revelation (e.g. Bozer or Jack finding the ring that was meant for Nikki). It’s possible this scene was filmed and edited out or cut together. I always felt the scene was a bit weird; the dialogue whileRiley snags the amulet from the chair never made much sense to me. 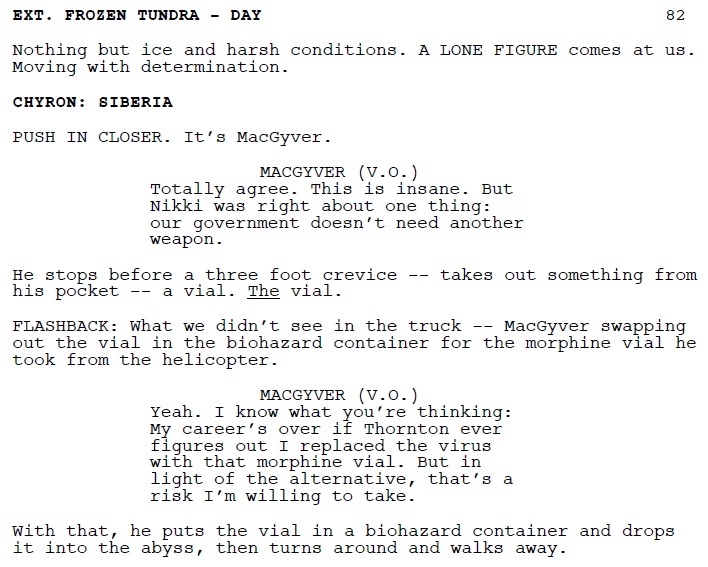 This scene takes place when Mac and Jack return to DXS after Mac was informed by Patricia Thornton about the bio-weapon being back on the market and Mac collecting Jack who was working on a movie set. It makes sense they shortened the voice-over because revealing too much about DXS (or Phoenix) would have limited the possibilites for upcoming storylines – at least in case they wanted to change direction during the Season while still figuring out what worked for the audience and what didn’t. To be honest, this snippet puzzles me a little bit. It does nothing but paint Jack being a bit incompetent at times. In the script, it’s mentioned that they haven’t seen each other in about 3 months and haven’t been at DXS either, where there is no mention of that in the episode. 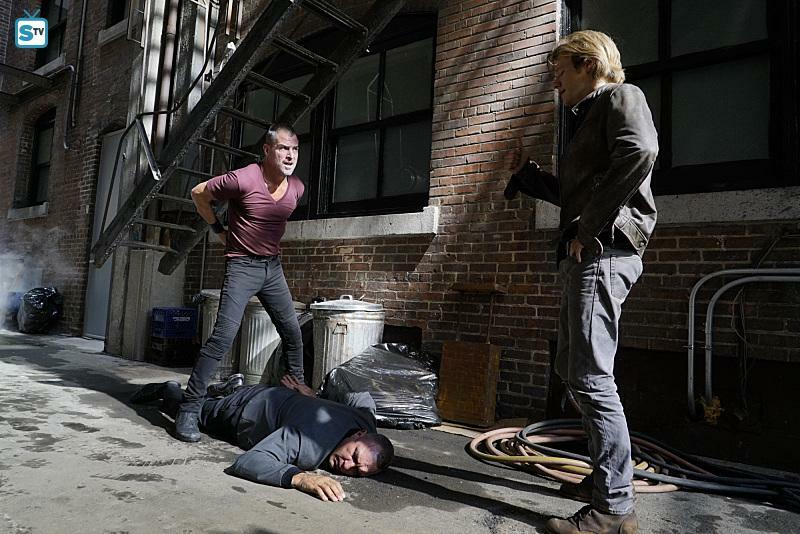 This scene takes place right when MacGyver, Jack and Thornton go visit Riley in prison. Again, it makes sense they didn’t reveal too much about the reasons for Riley’s imprisonement since this would have limited the possibilites for an upcoming Riley-centered Episode (which we got in Episode 1×11: Scissors). Again with the bikini-clad babes. Someone must be fond of those *lol*. This scene might have been re-written for budget or location reasons. It wasn’t necessary to film a scene that calls for a swimming pool and several extras; escpecially since the bikini beauties were already needed for the “Baywatch With Tanks”-Scene (you can find more about that one in this blog post). In the Pilot, the scene is set within a storage room. Sure, the scenery isn’t as nice, but it keeps the focus on the MacGyverism instead of the surroundings and the banter that happens beforehand. We got a bola for Episode 1×14 (Fish Scaler), though. It’s possible that the next scene had been filmed and was cut out in the editing room. 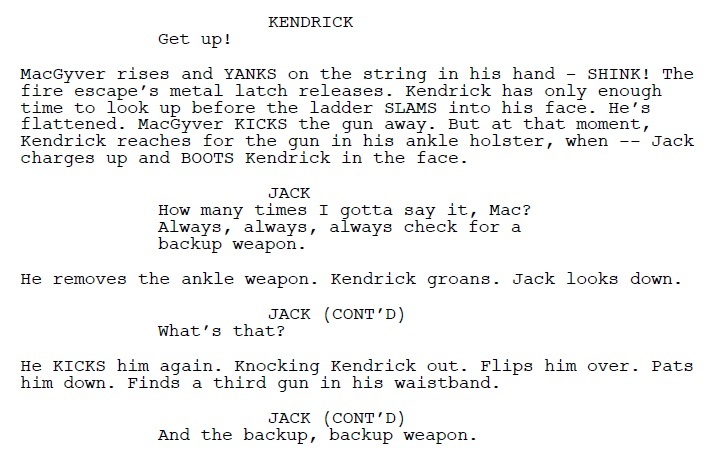 On the other hand, it makes sense that in the finished scene, Kendrick stays unconscious. In fact, it would have made more sense if he had been dead after the “incident” with the ladder. 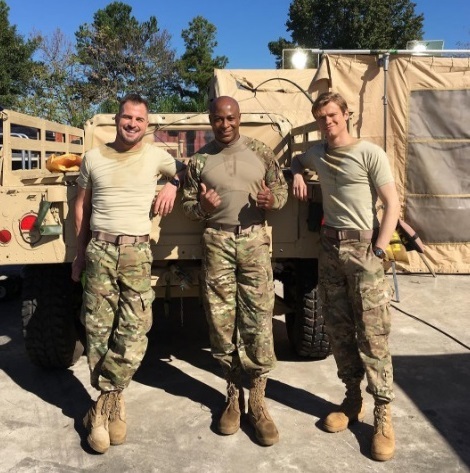 On July 19 in 2016, we got several pictures of a tank on set. A tank that soon got invaded by bikini-clad women in heels or boots while carrying weapons. Hmm. 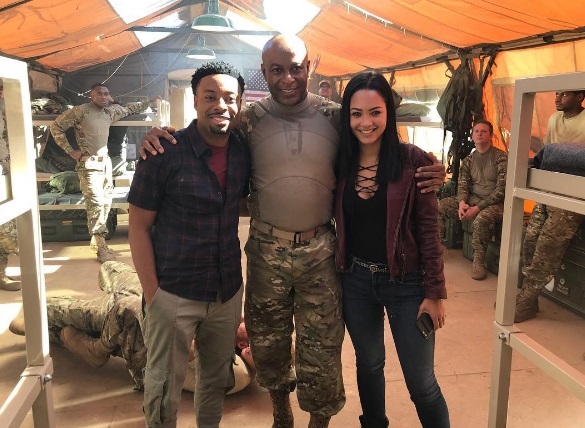 SkyDroneCinema called it a “hot hot day on set” while Lenkov asked the same question that fans have been asking on the MacGyver Online Forums and on the MacGyver Online Facebook Page: What does this have to do with MacGyver??? As more pictures turned up, we realized the scene also featured Ninjas. There had been a Casting Call by Central Casting Georgia looking for Ninjas on July 18, but seeing them together with gun-wielding “bikini babes” just made this even more surreal. Pictures of the Ninjas posing with the bikini girls would have fit for movies along “MacGruber” or “Sharknado”, so of course we weren’t just puzzled about this, but also concerned – because the material we had gotten the days before looked so much different. It felt like the quality of the production had just dropped a notch. Crew member Chris Payne Gilbert sure had fun filming this scene, as did George Ead’s Stand-In Mikey Leo and model Teresita Vicente (although she later deleted her Instagram picture stating she had been shooting Ninjas all day with a machine gun while wearing a bathing suit). 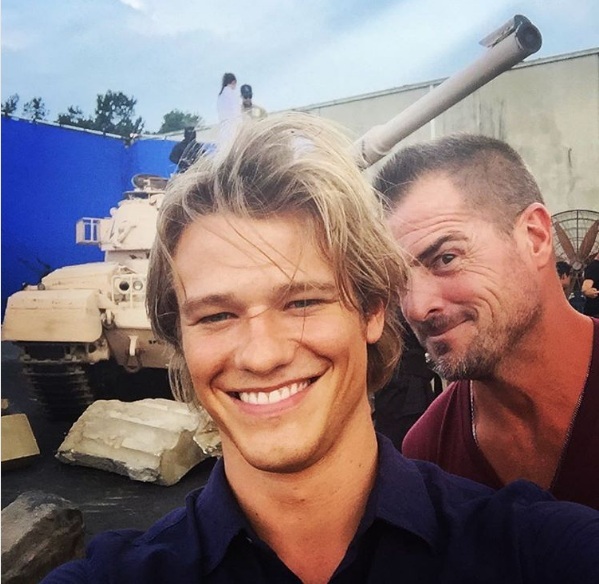 While some fans were as happy as Lucas Till and George Eads snagging Ninja-Shooting Bikini Babe India Batson for a picture, others were either confused or disappointed; stating that “Baywatch With Tanks” (thanks for this label, Miasma!) wasn’t the image the show should be going for. 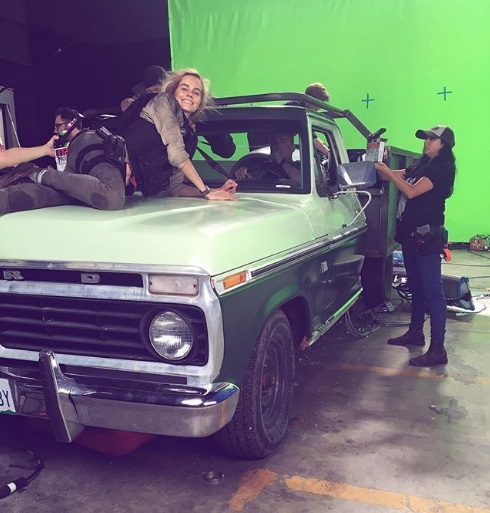 We kept guessing at what this scene should be for days. Opening Gambit? Weird Dream Episode? Music Video for the Soundtrack? Promo Video for Comic Con San Diego? 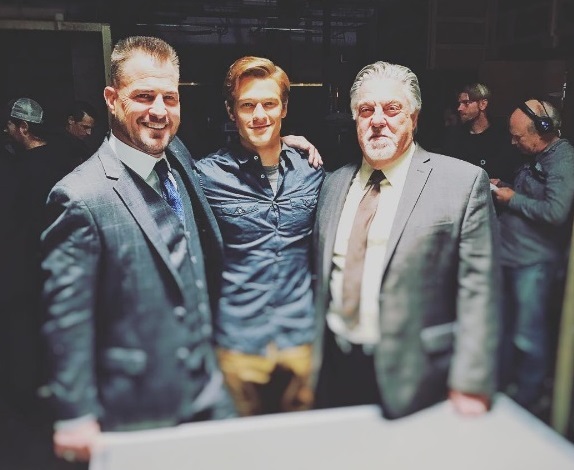 Maybe another production filming on the same studio lot and Lucas and George posing for fun during a break? As it turned out, all the excitement and chatter was for nothing because the scene got cut in the end. If you’re lucky enough to have gotten a DVD copy (Season 1 has only been released in Australia and the UK so far), the scene made it onto the DVD Extras. FunFact: A tiny shot of the scene actually had made it into one of the Official Trailers, so it must have been cut in the later stages of the editing process. 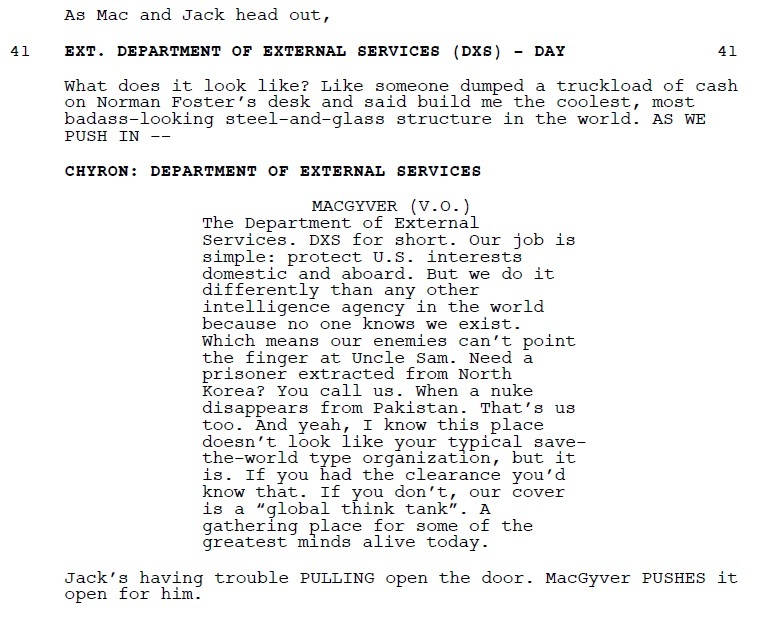 Looking at the script, this scene takes place after Patricia Thornton had recruited MacGyver back into DXS, stating his “vacation” was over. 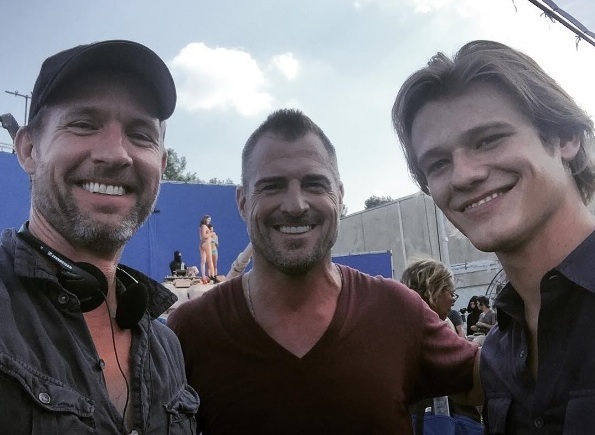 So while MacGyver was healing (both physically and emotionally), Jack was working as a tech consultant on a movie set. Interestingly, the script never describes much of the movie besides having a young and good-looking starlet with a machine-gun, playing a character being a spy working undercover. I’m curious to know who actually came up with adding Ninjas to the “Baywatch with Tanks” concept. 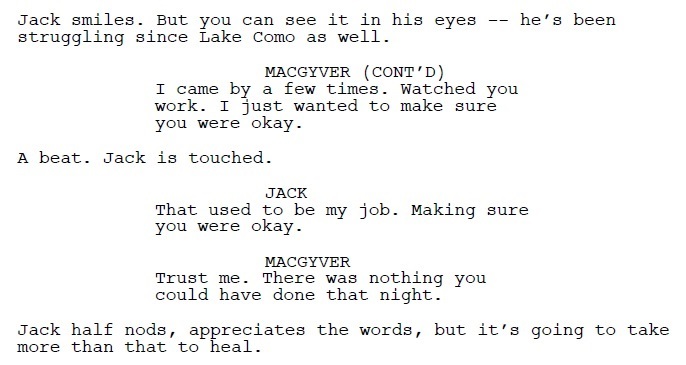 I don’t think it was hinted at in the Pilot Episode that Mac and Jack didn’t stay in close contact after Lake Como. 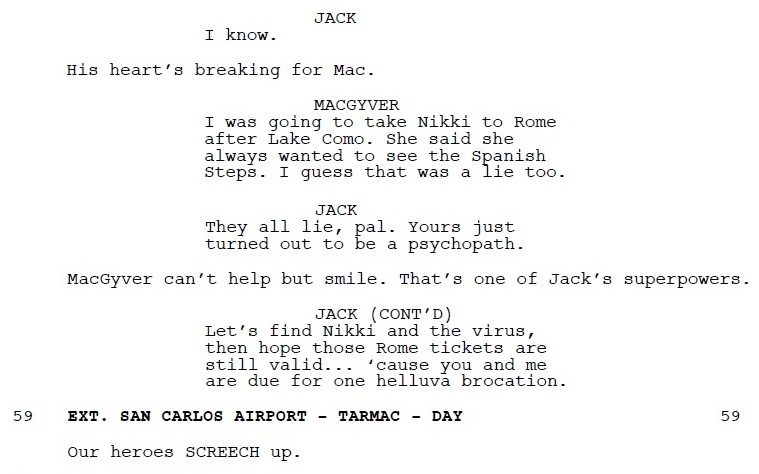 I’d think that Jack would have stayed at Mac’s side while being treated at the hospital, but it’s quite possible that Jack felt responsible for MacGyver’s girlfriend and valued team member Nikki getting killed and tried to deal with this guilt on his own. 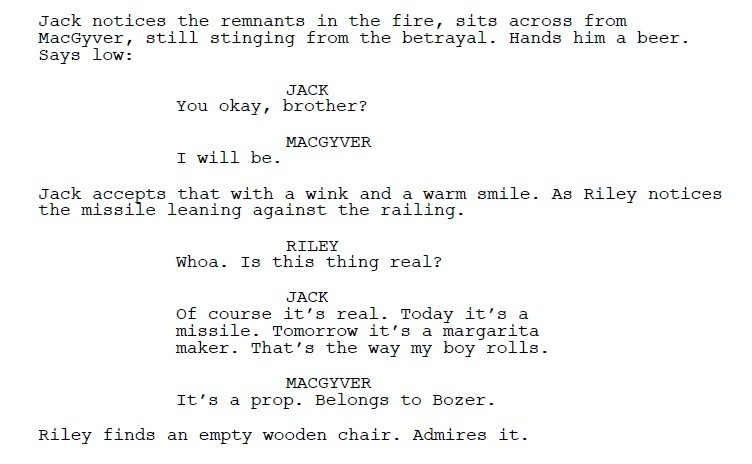 In the version that aired, Mac and Jack are simply reunited without ever talking about the events at Lake Como. While I’m aware that the scene was probably cut for time, this just again made me think that it would have been nice to actually get a two-parter for the Pilot Episode or maybe an episode longer than the standard 40-and-something-minutes. The role of “Tiffany” was played by India Batson. 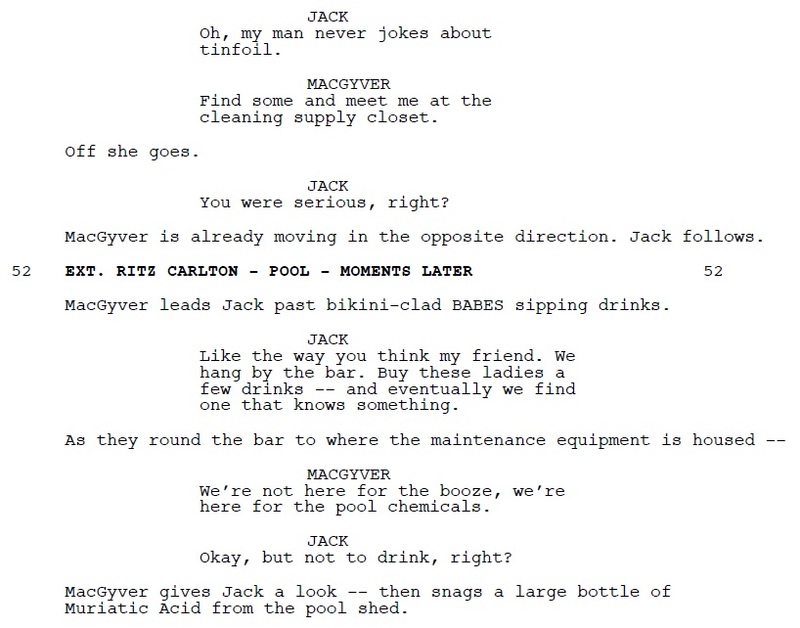 I feel bad for her the scene got cut, but besides painting Jack as a bit of a ladies man, it doesn’t do much for moving the plot forwards. Me being one of the “unlucky” ones without access to the DVD Extras, I can only speculate that the scene was cut for time. 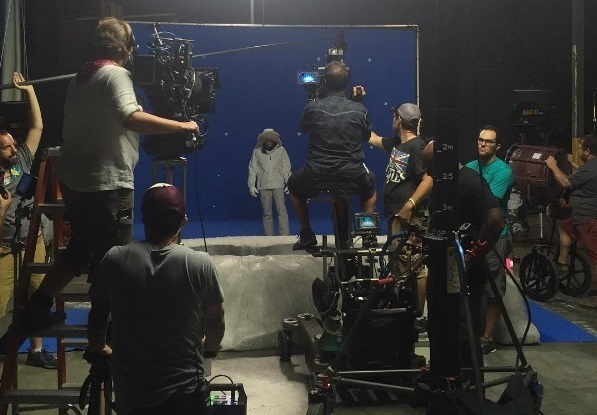 I don’t know much about filming budgets, but I’d say this was a rather expensive scene to let go of. I’m fine with dropping it, though. I’s not really relevant to the plot and rather slows it down. It would have been nice to have Mac and Jack talking about the mission and their guillt, but it wasn’t necessary to do it here. 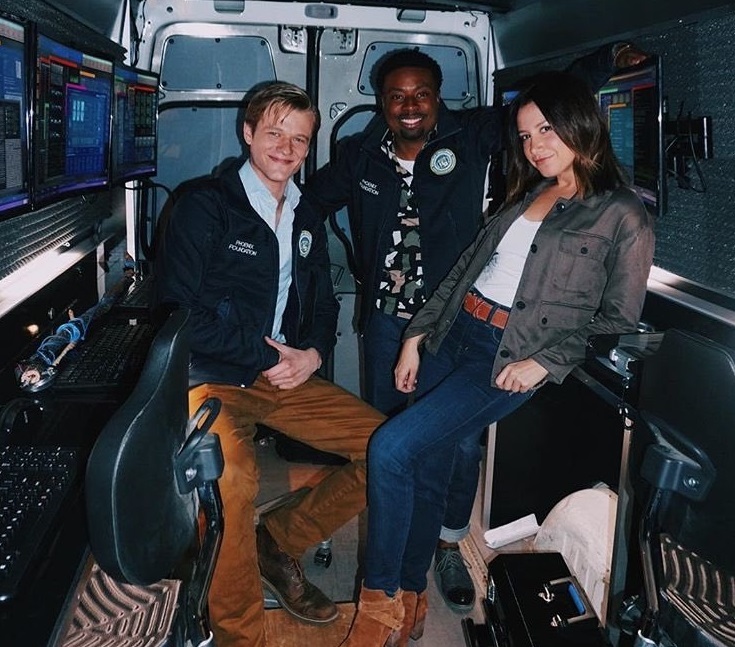 Also, since Bozer is the one being interested in movies and being a director, it would have made much more sense to me if Bozer worked on movie sets (e.g. as an Extra or in catering) to earn some experience in the field. They could have worked that into an episode with MacGyver having an adventure outside of Phoenix like in the Original Show – e.g. 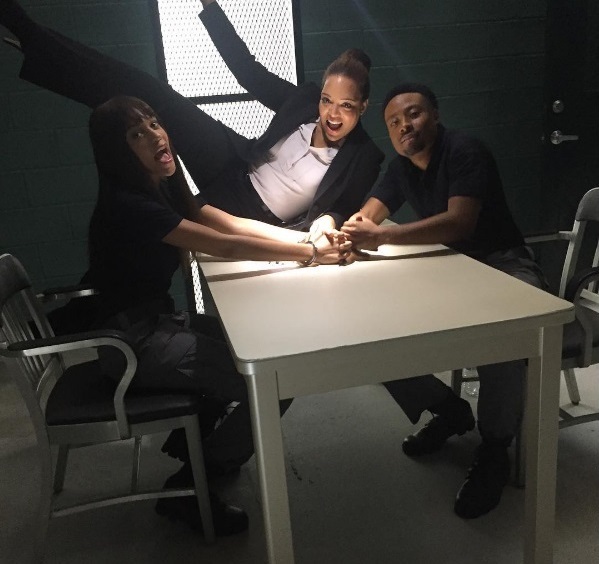 there’s weird stuff going on at Bozer’s work place aka the film set he got a little job at; similar to “Cleo Rocks”. 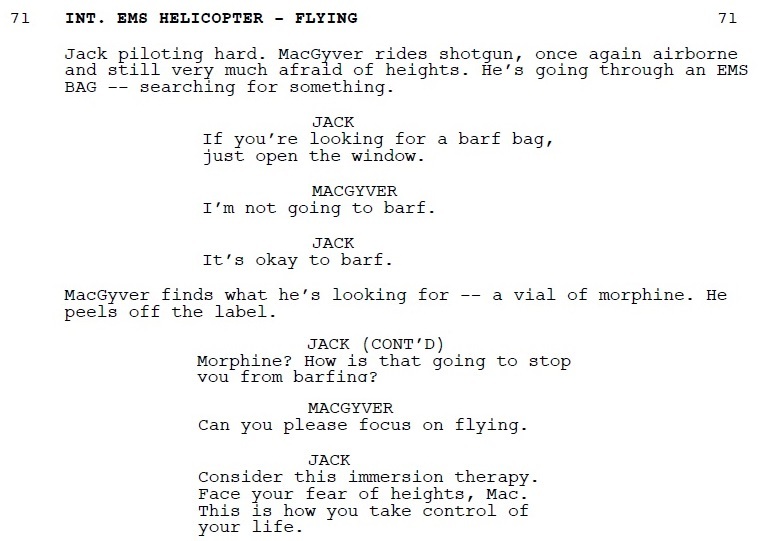 This scene takes place when Mac and Jack are in the helicopter, chasing the bad guys transporting the bio-weapon in the truck to its destination. The vial of morphine won’t be mentioned again until towards the end of the episode – you’ll see why further down. Original MacGyver was often annoyed by some of Jack’s comments. This scene here doesn’t feel very MacGyver, though. Original MacGyver might have thought Jack was naive and and gullible, but I don’t think he would have ever implied that Jack was mentally impaired. 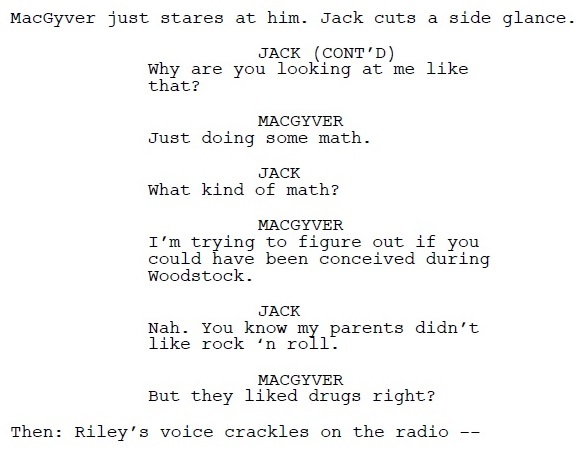 Also, rebooted Mac and Jack have known each other for years. It seems weird that Jack suddenly finds MacGyver’s fear of heights inconvenient and something that Mac should overcome right now, even though it might have been a topic before. 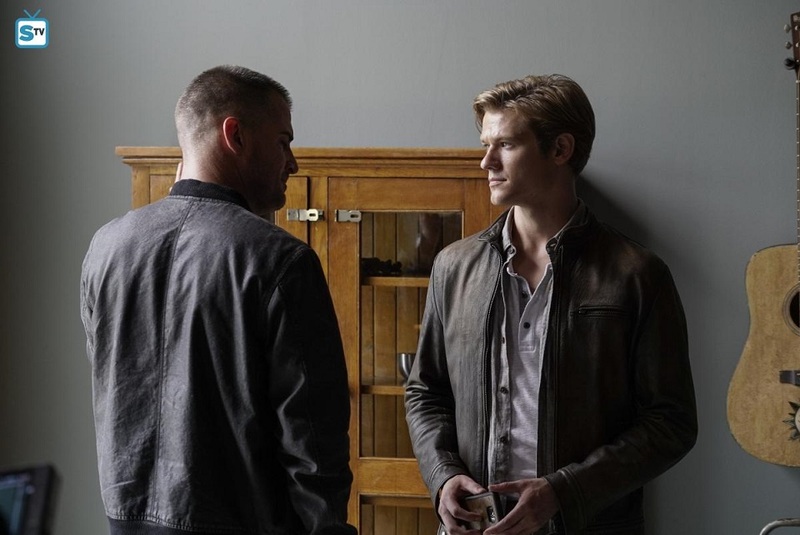 This scene takes place right after MacGyver and Jack secured the bio-weapon and before everyone meets at MacGyver’s and Bozer’s place; choosing a new name for DXS. This scene was actually filmed, but got dropped in the editing room – probably for time. I don’t think they had already the idea of “recycling” this for a later episode. 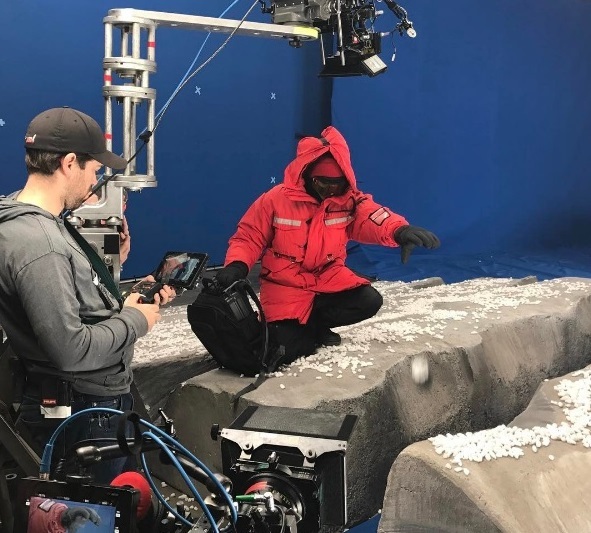 They reshot the Siberia Scene for the Season 1 Finale (1×21: Cigar Cutter), but without any voice-overs because the trip to Siberia happened under different circumstances. I would have actually preferred to see it here in the Premiere Episode. 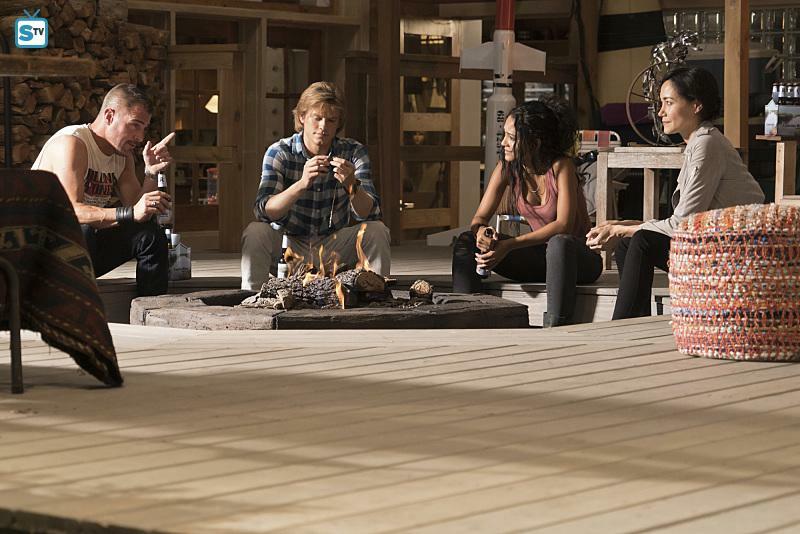 It feels very Original MacGyver; more than the version filmed for the Season Finale. 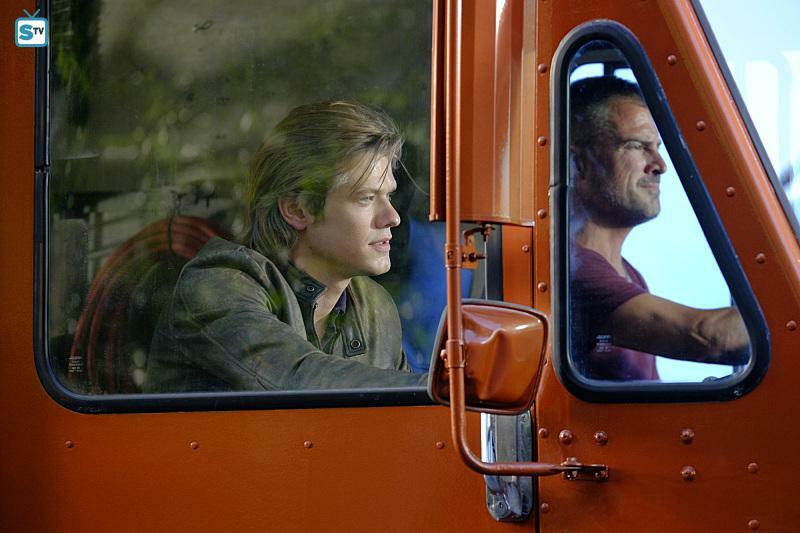 It shows the rebellious side of MacGyver; the side that is willing to breaking the rules to prevent potential disaster. 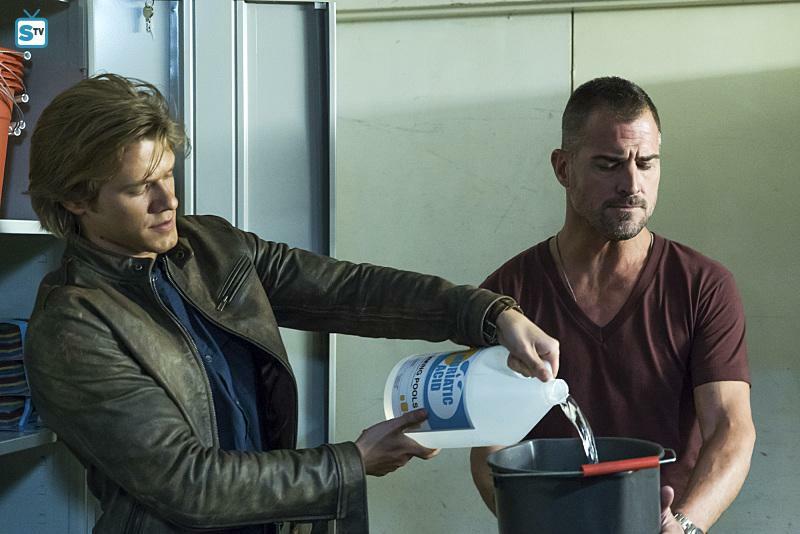 In the Season Finale Version, Jack and Matty knew what MacGyver was about to do; this was probably even sanctioned by Phoenix and Oversight.